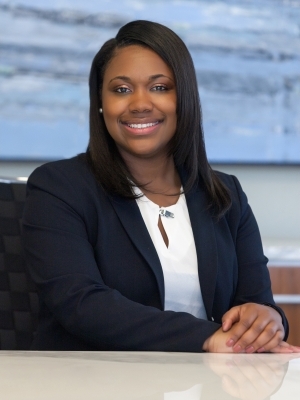 Jerina D. Phillips maintains a wide-ranging litigation practice representing individuals and companies in a variety of disputes, including complex commercial litigation, employment litigation, media and communications law, and consumer litigation. Jerina has successfully represented clients throughout the United States and across nearly every industry. Prior to joining Lewis Rice, Jerina clerked for judges at every level of the Missouri state court system, including an internship with the Missouri Supreme Court and a one-year clerkship with the Missouri Court of Appeals after her law school graduation. Jerina also completed a federal clerkship in the Southern District of Illinois. Jerina is a member of the Firm's Recruiting Committee. In 2018, she received a Women’s Justice Award in the Litigation Practitioner category and was selected for inclusion in Missouri & Kansas Rising Stars®. Jerina regularly volunteers with local non-profit organizations and serves on a number of local boards. Representing clients in virtually every type of business-related dispute, Jerina understands the significant impact litigation can have on a company’s ability to achieve its business objectives. To this end, Jerina works closely with clients to obtain a comprehensive understanding of their objectives for each matter and develop a successful strategy, which could include negotiating an early settlement or conducting extensive discovery and proceeding to trial. Jerina has successfully represented companies in defending against a wide variety of claims, including breach of contract claims, breach of fiduciary duty claims, and claims brought under the Missouri Merchandising Practices Act by individuals and as class actions. Jerina was a member of a defense team engaged to defend a company in what might be one of the largest class action lawsuits ever filed in Missouri. Jerina has significant experience in defending employers against claims of discrimination, including claims of discrimination on the basis of age, race, gender, and disability. From handling matters at the administrative phase to presenting evidence at trial, Jerina has successfully represented national retailers, public and private universities, and small, family-owned businesses in all of their employment litigation needs. Jerina also counsels employers on matters relating to the Fair Labor Standards Act, Americans with Disabilities Act, and the Family and Medical Leave Act. Jerina has experience representing clients in a wide variety of First Amendment issues, including defending against claims of defamation brought by business competitors.